“I am seeking clarification on whether the CHaIRS group, to which the FSA provided secretarial support as a member, met in December of last year and am requesting the final minutes of this 7th meeting of the Chemical Hazards and Identification Risk Surveillance group (CHaIRS)which was postponed from September. Canada Goose, mallard and coot earlier in the year and subsequent statement by the VLA that the incident “confirms white phosphorus release is occurring from the site”. Have the CHaIRS group been updated on this issue regarding that two further mallards and a black headed gull are awaiting testing for P4? This was a follow up request, given that a previous request indicated that the minutes had not been yet formalised. As this group supposedly was a forum exchange, we wanted to know if the recent updates regarding birds confirmed to have been exposed to P4 was being passed on from local contacts within the various organistaions of the CHaIRS group. The reply was received. The draft minutes of the seventh CHaIRS meeting were supplied which took place on 14th December 2010. Read them here. The word “alleged” is nonsense. These birds had been exposed to P4 and had been poisoned. For whatever reason, to continue along this line damages the professionalism of both the commentator and the organistaion being represented. The fact that our Freedom of information request had revealed the lack of investigation involving the CHaIRS group concerning this incident is as “concerning” as the attitude of Rhodia to the issue. There were “concerned members of the public” who had reported dead birds being present on the lake, and “concerned members of the public” who had found out that the said lake contained toxic rat poison in the sediment. The same “concerned members of the public” had tried to get the authorities to take the matter seriously to be met with scepticism and pure ignorance. 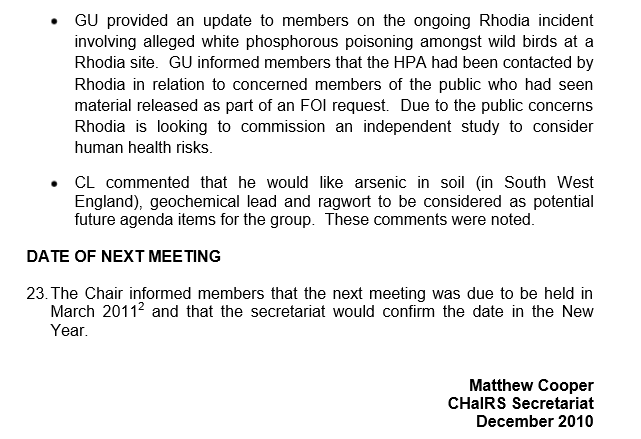 It was only when these “concerned members of the public” went public with the information, that the likes of Rhodia and the quangos within the CHaIRS group started to become “concerned” themselves. Those “concerned members of the public” were SANDWELL SWANWATCH. 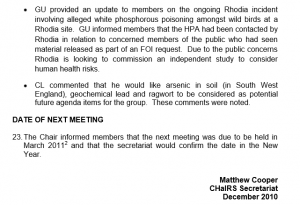 The disclosure concerning Rhodia’s PR move concerning human health- by now they must have realised they had lost the battle to try to explain away the bird deaths, was a whole new set of freedom of information requests to the HPA.